Shrimp has been such a treat it seems lately due to the warmer weather. This recipe is sure to please and is perfect for those following the Adrenal Reset Diet. It contains a ton of fresh ingredients and flavors. Not to mention, it is packed with Omega 3, Selenium, and Vitamin D. You can’t beat healthy and delicious, enjoy! 8 fresh basil leaves, sliced. Warm a teaspoon or two of olive oil in a large skillet over medium-high heat. Add the onions and sauté until they begin to soften, 5 to 7 minutes. Add the garlic, 1/2 teaspoon of salt, pepper, and a pinch of red pepper flakes (depending on how spicy you like your food), and cook until fragrant, about 30 seconds. Stir the diced tomato into the onions and cook 2 to 3 minutes, until some of the tomato liquid has evaporated and the tomatoes are beginning to break down. Add the spinach and stir until wilted. Add the beans and chicken stock, and simmer for a few minutes until most of the liquid has evaporated and the beans are warmed through. Stir in the basil, lemon zest, and juice. Taste and adjust the seasonings as desired. Turn the heat down to low and partially cover to keep warm. Wash the shrimp, pat them very dry, and season both sides with salt and pepper. Set a second pan over high heat and coat the bottom with olive oil. 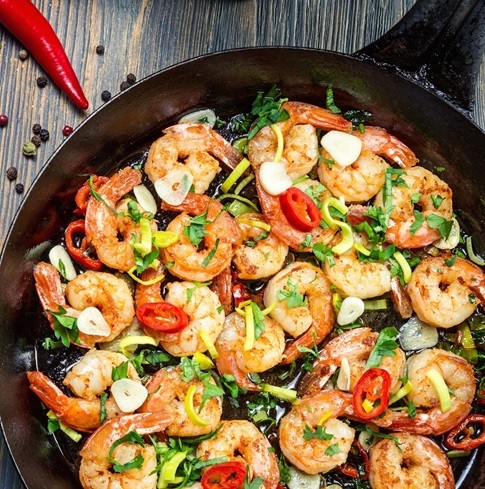 When the oil is hot enough that a flick of water evaporates immediately, begin cooking the shrimp in batches. Cook the shrimp, 1 to 2 minutes on each side, until they are pink and opaque all the way through. Transfer to a plate. To serve, spoon the spinach and bean mixture into bowls and top with a few of the shrimp and serve on top of 3 servings brown rice.